I may have already shared Rifle Paper Co. and Anna Bond's work on my blog - but this project on Martha featuring her designs was too priceless not to share. The Book-Themed Baby Shower has some great free templates that would be so easy to use - and so original. 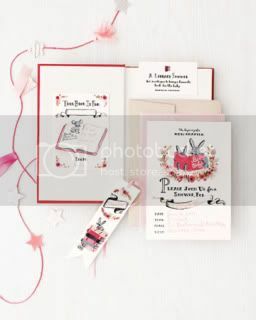 The templates include the invite plus a matching bookmark and name plate. Even if you weren't using the whole shower package - the book name plates are cute enough to just print and use. And of course they do a great job of pulling together a "Mother Goose-themed menu." If you are here in Sacramento, you could go really big and have the party at Fairytale Town. Speaking of Fairytale Town - June 4 you can go see Jackie Greene in concert and tickets are only $25 if you purchase in April (they go up to $30 in May and $35 in June.) Maybe I'll go for my birthday. Ok. Now this post is getting random. Hope you're having a good week! Se lo recomiendo a todo el mundo .. Gracias por los recursos!